This marble statue carved with sensitive details and painted with soft touches of light colours, a most accomplished image, represents Vishvakarma Ji, one of the primary divinities that preceded Creation. As the terms ‘Vishva’ and ‘karma’, when combined, literally mean the doer of the universe, Vishvakarma is the creator of the cosmos, that is, all that is manifest as also all that is not manifest, even what is said, heard, thought or felt. In the Rig-Veda Vishvakarma has been perceived as the ultimate reality and his navel wherefrom all things emanate as Hiranyagarbha – the golden egg. As a matter of fact the Puranic Padmanabha imagery of Lord Vishnu : a lotus with Brahman mounting it rising from his navel, is largely influenced by this Rig-Vedic Hiranyagarbha form of Vishvakarma. Thus, while on one hand the Rig-Veda visualizes Vishvakarma as Omnipotence and the abstract form of the creator God personified, on the other, it perceives him as the deity presiding over all craftsmen and architects, and sometimes as the Principal Architect of the Universe. Later, it was on this Rig-Vedic dual visualization of Vishvakarma that there emerged the Upanishadic concept of Brahman, as also that of Purusha who is Sadashiva, One who creates and creates out of Him, Himself the Creator as also the matter to create out of. 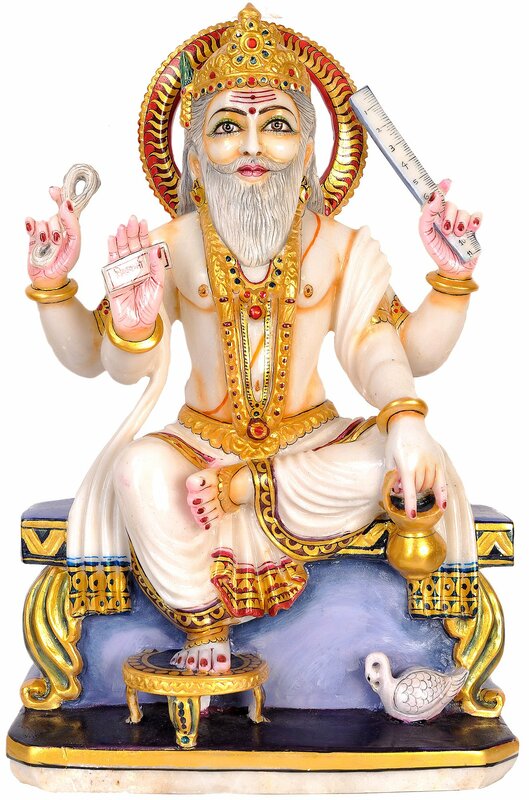 Hence, while in later mythology Vishvakarma and Brahma merged into one divinity and emerged as one of the Trinity Gods in many traditions Vishvakarma was one of Brahma’s aspects that Brahma deployed to create as when in the Mahabharata Vishvakarma was put to build the Pandavas’ new capital Indraprastha ; obviously, he was treated as the divinity that worked by deployment, a status subordinate to a Trinity God. In visual tradition the two divinities are seen as sharing some of the iconographic features and also some attributes but it identifies the two with absolute clarity. Both are four-armed images with bearded faces reflecting old age invariably conceived as seated in Padmasana, on a lotus seat or an ordinary one; however, while Brahma is a four-faced icon with Vaishnava ‘tilaka’ mark on the forehead, Vishvakarma’s images are conceived with a normal single face with ‘Shaivite ‘tripunda’ mark on the forehead. Contextual to his origin from Vishnu’s navel emerging therefrom riding a lotus, Brahma has usually a lotus seat while linked to creative process and thereby to mechanical and architecture sphere Vishvakarma usually has, as here in this statue, a manufactured seat. The images of Brahma are conceived as carrying in three of the four hands a ‘kamandala’ – pot with a spout, rosary and the book symbolic of the Vedas, and the fourth is held in ‘abhay’ – gesture of protection, the attributes that Vishvakarma images carry, as carries this marble statue, are ‘kamandala’, measure scale, book and noose – all abounding in greater symbolism, more so the scale – the tool of an architect, and the noose, the tool of dragging the inhabitants into the fold as also of dragging beyond the bonds of the material world although his own creation. The book in Brahma’s iconography is symbolic of Vedas; here inscribed Vishvakarma on it the book could mean his work-manual. This marble statue of Vishvakarma, outstanding in its artistic merit, figure’s modeling, proportions, finish and absolutely balanced parts, has been installed on a seat consisting of artistically carved legs and a relatively simple top. The figure has been conceived as seated in ‘lalitasana’ – a sitting posture revealing great aesthetic beauty. Under his right leg suspending down there is a circular foot-raise and towards the left leg there perches a tiny white bird, a goose, often the part of Brahma’s iconography symbolising absolute purity. The left leg lies horizontally on the seat’s top in semi ‘yogasana’ posture. The figure’s face has been conceived with a narrow sharp nose, large open eyes with arched apexes and well trimmed eye-brows and an angular beard consisting of a mix of white and black hair. There is around his face a halo consisting of flames-like design. He is putting on a moderately sized headgear studded with rubies, emeralds and other precious stones. Whatever the position in later texts and traditions even today Vishvakarma is pan India the presiding deity of all mechanics and architects and special prayers and offerings are made to him at least once a year on Vishvakarma day. Not only the annual calendars of hundreds of engineering establishments carry on them an image of Vishvakarma most of the workshops in India have at least a framed photograph of Vishvakarma on their walls or a sculpture representing him, whatever its medium, enshrining their premises.